WINNERS CIRCLE: Members of the Princeton Day School boys hockey team circle around forward Alex Nespor (No. 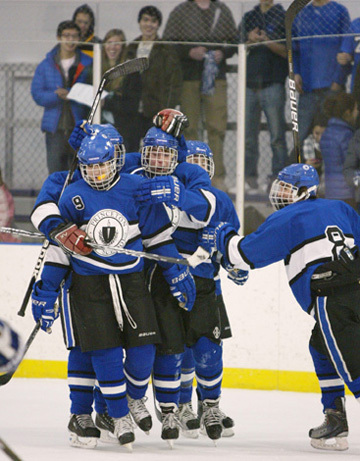 9) after he scored a goal in the state Prep championship game last Thursday at McGraw Rink. Sophomore star Nespor scored two goals as third-seeded PDS edged top-seeded Pingry 4-2 for its first Prep title since 2006, For more details on the game, see Sports. The Princeton Fair Tax-Revaluation Group convened its fourth community meeting last Wednesday to discuss the groups investigations, progress, and to hear about the prospects for legal action to overturn and redo the controversial 2010 tax revaluation. The Borough received a briefing on its debt management plan at the Council meeting last week, which showed that the municipality is in sound fiscal shape with respect to its spending on major capital projects. Clothing and artisanal cheeses are coming to Palmer Square in the next six weeks. The three new stores will take up residence on the west side of the square, with Palm Place being the first to open this Friday, February 18. The establishment is an offshoot of one by the same name in Manasquan, and is a Lilly Pulitzer signature store, carrying clothing primarily by the designer. What is This Thing Called Love? wondered the incomparable composer-lyricist Cole Porter in a 1929 song. The Princeton University curators of the newest exhibit in the Murray-Dodge lobby on the campus have cut to the quick by simply asking What is Love?, and although Valentines Day was on Monday, its not too late to take in the engaging images submitted by University students, faculty, and staff members in response to that question. Following the closed session discussion by Borough Council last week, the governing body continues to debate how best to approach further discussion pertaining to the original Arts and Transit Neighborhood proposed by Princeton University. Theres always going to be conflict where there are children, observed Goddard School owner Edwin Sirak. The solution, he suggested in a recent interview, lies in turning instances of bullying into a teachable moment. The lesson, he emphasized, has to do with helping kids understand the differences among them. When the Princeton Day School boys hockey team suffered a deflating loss to the Academy of New Church in mid-January, PDS senior co-captain Peter Blackburn decided it was time for an attitude adjustment. Back pain, neck pain, shoulder pain, knee pain, arthritis, tendinitis, bursitis  and all the other itises! Just about every adult has had a bout with one of these painful problems. For most, dealing with it includes a trip to the doctor, whether for pills, injections, physical therapy, or in worst case scenarios, surgery.